Former Polish President Lech Wałęsa said last year that in 1987 the then Vice President George H.W. Bush showed “he was a friend of Poland” and convinced him that Poland can get rid of communism. Former Polish Solidarity leader made that remark in reference to George H.W. Bush’s visit to Poland in 1987 at the request of the then President Ronald Reagan as the communist regime headed by General Wojciech Jaruzelski was beginning to falter. George H.W. Bush, 41st President of the United States from 1989 to 1993, died November 30, 2018 in Houston, Texas at the age of 94. Thousands honored him at the state funeral service in Washington Wednesday attended by his son, former President George W. Bush, former President Bill Clinton, former President Jimmy Carter, and President Donald Trump. Lech Walesa and Poland’s current head of state President Andrzej Duda were among foreign leaders attending the funeral. A smaller, private funeral service will take place on Thursday. “The fact that Vice President Bush was on our side firmed up my belief that there was a real chance to get rid of communism,” Lech Walesa said in an e-mail response to questions submitted to him last year by former Voice of America (VOA) Polish Service director Ted Lipien who had covered Bush’s trip to Poland in 1987. The questions were for a book about George H.W. Bush’s contribution to the fall of communism being written by his former aides Gary E. Fendler and John G. Keller. Lech Wałęsa w 2017 r.: Czuło się, że Pan vice-prezydent [George H.W. Bush] zna dokładnie wszystkie problemy świata, że jest przyjacielem Polski i chce coś dla nas zrobić. Widać było również, że ma określony stosunek do ZSSR. Lech Walesa in 2017: “One sensed that Vice President Bush was thoroughly familiar with all global problems, that he was a friend of Poland and wanted to do something for us. It was also obvious that he had a clear-cut stance on the Soviet Union. 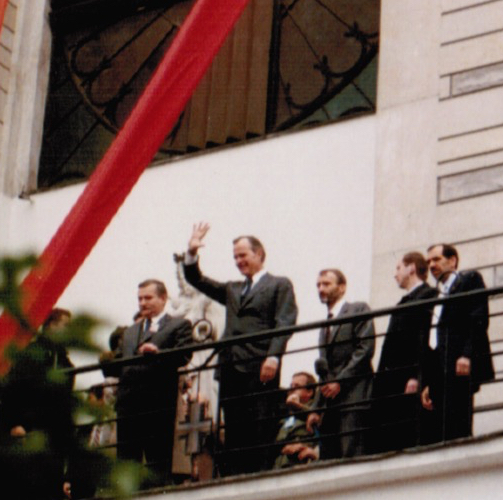 During his 1987 visit to Poland, George H.W. Bush urged General Wojciech Jaruzelski to come to terms with Lech Wałęsa. Subsequent negotiations between the regime and the opposition resulted in a peaceful transition to democracy in Poland beginning in 1989. Vice President Bush and Lech Walesa standing next to the kneeling parents of Father Jerzy Popieluszko, Władysław and Marianna Popiełuszko, and other family members at the slain priest’s grave in Warsaw. Photo (1987) by Ted Lipien. 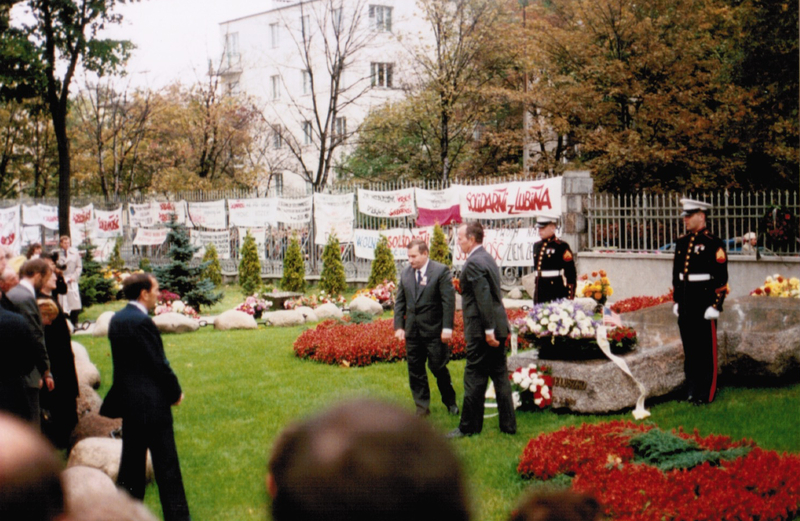 In September 1987 Vice President Bush also met with Polish Catholic bishops and visited with Lech Walesa the grave of Father Jerzy Popiełuszko whom officers of the communist secret police had murdered in 1984 because of his support for the Solidarity-led pro-democracy opposition movement in Poland. 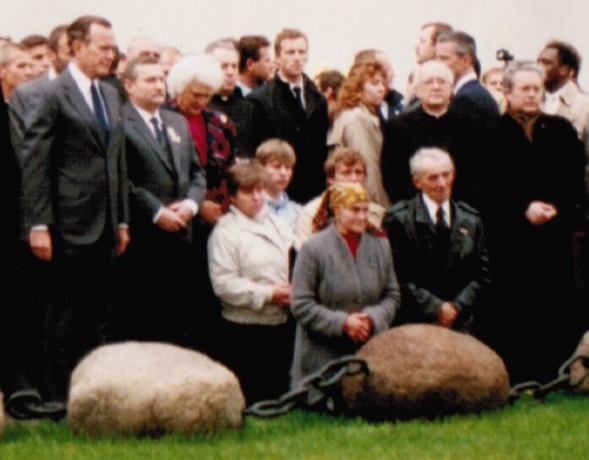 The Vice President met at the gravesite with Władysław and Marianna Popiełuszko, the parents of the slain priest.